Kim Sweet (Lisa Sheridan) just moved her young son Brody (Jonah Beres) from L.A. to the backwoods of Minnesota to take care of her ailing father Chuck (Bruce Bohne) at the height of these anomalies. Strange happenings within nature begin showing themselves to these outsiders immediately. What they don’t know is the real dangers of what’s happening. It appears these mutations have just gotten deadly. The following is based on a true unsolved ecological mystery in the heart of America. Writer and director James Ojala takes a real life event and turns it into a throwback horror movie. I haven’t seen so many potential victims crumble to the ground in terror since the 1970’s. An off-screen killer and some practical effects scream 70’s horror and the fact that this movie tries to make a statement about the environment represents exactly what that generation is all about. Bruce Bohne gives one of my favorite performances in the film as Grandpa Chuck. Love him or hate him veteran actor Stephen Tobolowsky always delivers, never seeming to age in any of his roles. Lisa Sheridan shows us the kind of soccer mom she isn’t in a truer to life lead role. Even though make-up effects could use some touch-ups, I appreciate the practical and enjoyed David Mattey and his beautiful onscreen daughter Chalet Lizzette Brannan as the “freaks” next door. B-Horror actress Tiffany Shepis even has a cameo as a fallen victim. Then there are the Minnesota rednecks... Lead by professional wrestler John Hennigan, the characters are a little too stereotypical to work for me overall. That being said relative unknown Angela Duffy easily gives the film’s most authentic and genuine performance. I also really enjoyed discovering farmer Larry (Justen Overlander) and his furry friends. It was silly but I got a kick out of it. 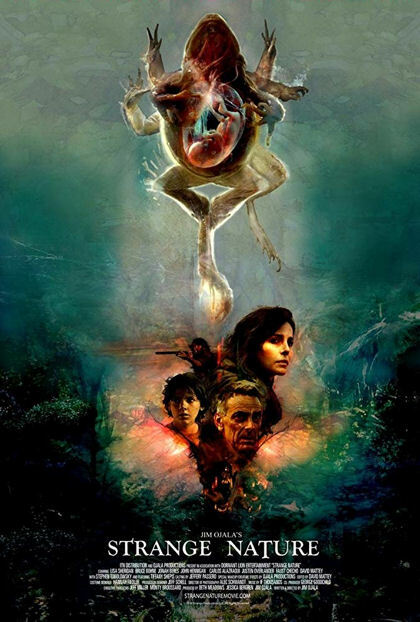 Strange Nature has beautiful and intriguing poster art that stands out from your other typical horror fare because this isn’t your typical horror movie. Sure there’s an off-screen killer taking out fallen victims with a bit of gore but it’s actually a tale of an investigation into an ecological anomaly under the guise of a horror film. There isn’t much superior about this lake. In fact I could have used a little more horror in the “eco-thriller”. I do enjoy the birth defects from director James Ojala but overall could have used a little more happening in the Strange Nature of his first film.